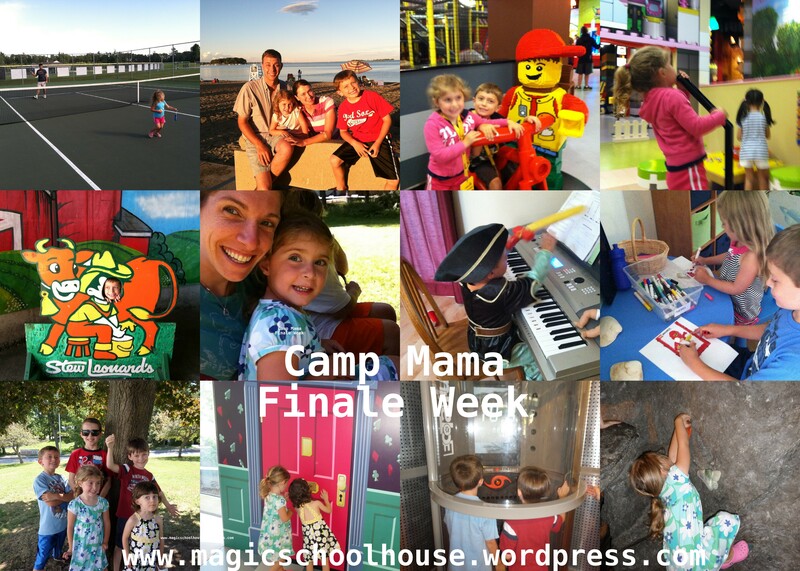 We had a wonderful last week of Camp Mama. The “Finale” was the perfect way to end our very special camp. We revisited many of our old themes and looked through all of the pictures we took over the summer. This was a great week of reflection, celebration and fun. The week began with a family tennis game and trip for ice cream. The kids and I then went on a road trip to see Auntie Amber and Uncle Andy where we hit the beach and LEGO land. Wednesday we went to the Ecotarium with good friends. Here we went on a train ride, checked out the animals, had fun with their Mt. Washington Exhibit, played with sound and had a great time. Thursday we had a playdate with the cousins and we played LEGOS, princesses, spent a lot of time outdoors and made loads of crafts. The rest of the week was spent reading, playing and reflecting. Camp Mama has been a wonderful experience for the kids and I. It has filled our summer with fun and learning. We are already thinking about next years themes and hope that you will come along on the journey with us again next summer. Or better yet, start your own Camp Mama….you will be happy that you did!